Arab Israeli Wars is a solitaire PC game based on the Warp Spawn rule set by by Lloyd Krassner. The game should have full functionality, but does remain rough around the edges. In particular, the User Interface retains some of the “debugging” dialogs and the extent of testing, particularly across the Windows platform, has been limited. Enjoy at your own risk. The game play is very simple and straightforward. Combat is by comparison of force numbers, rather than being influenced by “dice” rolls. There is still a random element from the ordering of events and the selection of units, but there is little going on that is not on the screen in front of you. As a solitaire design, there is no “artificial intelligence” to contend with. You are playing against the board the way it gets deployed. Installation is via a downloaded executable, and should be straightforward when following the prompts. In the current size the of the game window is 1650X800. That means that the window will not display properly on displays with a lower resolution. Screen resolutions of 1680X1050 and 1920X1080 should work normally. The window can be resized, allowing it to fit other resolutions. When this happens, the scaling of the graphics makes it a bit fuzzy. The Game was built for Windows 7, and hasn’t yet been tested for forward or backward compatibility. Once installed and running, you should see a map of Israel circa 1946. The map is divided into three regions or “fronts” outlined, as shown above, with a red dotted-line. Each region has a Score Bar, divided into six segments, to represent territorial control over that region. Pressing the “Start Game” button in the center (Mouse left-click) will start the first turn. On the first turn, there is no resolution of battles. In any subsequent turn, the event may skip or modify the other turn phases. On each turn, the computer will deploy three Arab units, selected randomly from the total unit availability. Three units are deployed to Galilee (the Northern Front). The above screenshot shows three Arab units deployed to the northernmost front, near Galilee. They are from left-to-right, a unit of the Arab Liberation Army, and unit of Armored Cards, and a unit of Artillery. The unit designations and colors are not a factor in the game, but there are two details on these unit counters that are important. In the lower right corner of each unit, there is a “Force” number. This number will be used to determine the winner in battles. In the upper left, shown on the left-most counter only, there is a letter “N.” This indicates that the Arab Liberation Army, organized in Syria, is only used in the northern part of Israel. Whenever this unit is selected, it is deployed to the northern front. The other two units have no such designation in the upper-left. These units, when selected for deployment, are placed at random among the three fronts. Immediately following the deployment of Arab units, an event is selected (at random). Events impact the game by altering unit strengths, deploying additional units, or by negating or altering battles results. Events may take place immediately (addition or removal of units), or last for the remainder of the turn. If an event alters the strength of units, these changes are represented on the map. In some cases, an event may provide a bonus to the front as a whole (e.g. +5 Force to the Northern Front). In that case, that bonus is noted on as text the map. In other cases, the event provides the bonus to each unit, either within the front or for all units on the side. Arab units have received a +1 bonus to their force per an event. In the example above, the Event has applied a +1 bonus to all Arab units. The modified force is now shown on the counters, with an asterisk (*) to show that the force level is temporary. In some cases, the player may be asked to select the front to which the event is to be applied. h – Help: lists the available hot keys. s (w/ mouse over a front*) – Score: tallies force totals, including bonus, for indicated front. i (w/ mouse over a unit) – Information: shows unit details. *Front must contain a friendly unit. The player now places his units for the turn. While the Arab side gets three units per turn, the Israelis receive, nominally, two. This may be modified by the event for the turn. To deploy a unit, select it with the left mouse button and drag (with the mouse button depressed). Drop the unit within the boundaries (red dotted-line) of the front in which you wish the unit to be deployed. It is not possible, at this stage, to move units already deployed in a front, or to move Arab units. A pair of Hagana Brigade units, deployed near Jerusalem. Israeli units have a similar appearance to their opponent, with some unit designation information and the force level in the lower left corner. Unlike the Arab units, there is no designation for a front. The player may place his units in any of the three fronts. One remaining Israeli unit is available to be deployed. The above screenshot shows the Israeli deployment area, with one unit waiting to be deployed. The player must deploy all units in each turn. Once all of the units have been deployed, the deployment area disappears from the screen, and the Israeli player now has the option to transfer units. Two types of units, the Irgun Commandos and the Lehi, are not deployed in the usual matter. Instead, during the deployment phase they are transferred directly to a front selected at random. Each turn, after deploying the new units, the player has the opportunity to transfer units between fronts before the battle results are calculated. The event may specify that the player gets more than one transfer, but at a minimum the player is always allowed a single transfer. Two armored car units in Gaza. Some Israeli units have a “v” designation in the lower left corner of the counter, as shown in these two armored car units above. This indicates a “vehicle” capability for the unit. In addition to the allocated transfers, vehicular units may be transferred freely between fronts as long as there is still an available transfer of a normal unit. You may elect to transfer less than your allocated transfers, including no transfers at all. If this is the case, select “No” when prompted to make a transfer. After all available transfers are used, or after you say “No” to further transfers, the force values are compared for each front to determine the outcome of the three battles. The total force for a side is calculate by adding the total of all units, including any bonuses applied by the turn’s event. Leaders have no force values themselves, but instead apply a +1 force bonus to each friendly unit in the same front. The side with the greater force wins the battle. The loser must remove one unit or leader (randomly selected) from that front. In addition, one control segment is transferred from the loser to the winner. The the loser has no units present in the front, two segments are transferred from loser to winner. If the force totals are tied, the result is a “stalemate.” In this case, no territory is exchanged, but each side removes one unit or leader (randomly selected). A stalemate may also be created by an event. When this occurs, the force totals are still shown, but the result is the same as if the totals had been tied. Pressing “s” with the mouse over the Northern Front calculates the score. The above screen shot shows a score calculation for the Northern Front (Galilee). The Arab side has six units with no bonuses, so the total for that side is 13. The Israelis have two Haganah Brigade units (base force 5 each), modified by a +1 event. In addition, leader Yigal Allon provides another +1 per unit. The total, after all modifications, is 14. Assuming no units are redeployed, this would be an Israeli win. 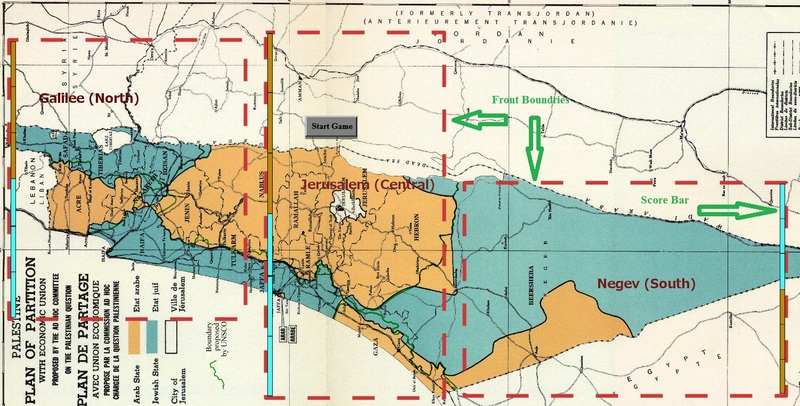 The Arab side would lose one unit, and one Arab control segment would be transferred to the Israelis, resulting an a territorial control of 4 to 2. If the the event for the turn is a “Truce,” then no Battle Resolution takes place, and the game proceeds to a new turn. After all three battles are determined, the victory conditions are evaluated. If neither side has won the game, then the game continues with another turn and a new Arab Deployment. If the Arab side controls all 6 territorial segments for any of the three fronts, the player loses the game. If the Israeli side wins all three Battles for two consecutive turns, the player wins the game. Also, if all 53 possible Arab units have been played and there is no winner by either of the above conditions, the player wins. The rules are the creation of Lloyd Krassner at Warp Spawn Games. It is designed as a card game, but you might see that the mechanics are the same when using the counters. For more insight or clarity regarding the rules, the link should be accurate regarding the computer implementation as well. In particular, it contains the entire list of armies and events, which may be useful in planning. For the most part, the graphics used in this game are either original creations or created from photography in the public domain. I apologize in advance, and mean no claim on others’ intellectual property, if something has escaped my notice. Some specific exceptions follow. The Al Najada picture is the personal property of Umm Tariq Subhi. Several of the designs fall under the Creative Commons Share-Alike license. That license also applies to the modified versions of these designs, as used within this game. Note that the use of these designs does not imply permission or endorsement by the authors. Arab League emblem by Jeff_Dahl. All remaining assets remain the property of A Plague of Frogs. Although the program is freely available for sharing, it is not for commercial use. Distributions should reference the credits as listed here. Helena on Ain’t she a beautiful sight? Mr WordPress on Mayday, Mayday, Mayday!